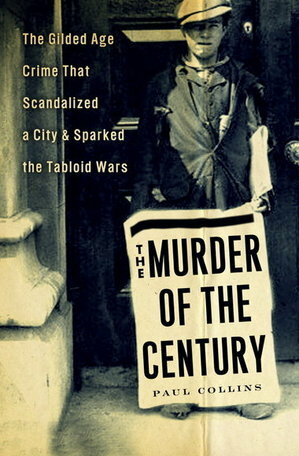 On sale today is Paul Collins’ newest book, Murder of the Century: The Gilded Age Crime That Scandalized a City & Sparked The Tabloid Wars. How do you know Paul Collins? FB&C readers may recall that he wrote for the magazine once or twice, that he is NPR’s “literary detective,” and that he is the author of such bookish titles as Sixpence House, a memoir of life in Hay-on-Wye, and The Book of William, a sleuthing history of the first folio. This new book is an account of a grisly New York murder at the tail end of the nineteenth century. A human torso is found floating in the East River, severed limbs in Harlem, and a mysterious bloody pool in Long Island -- and who’s piecing it all together but the newspapermen employed by Joseph Pulitzer (for the World) and William Randolph Hearst (for the Journal). The vile details of this murder mystery created the perfect storm for tabloid journalists, who, in many cases, worked harder and better at locating evidence and suspects than the police. Of course, they also plotted against each other, fighting for higher circulation. Though a different case, Collins’ true crime tale is reminiscent of Patricia Cline Cohen’s The Murder of Helen Jewett. His publisher also makes an apt comparison to Larson’s Devil in the White City. Which is to say that this is a book that has been thoroughly researched and has solid history within, and yet it is far from a dry, scholarly tome. The rich cast of characters -- a married midwife murderess among them -- is better than one finds in fiction. Collins is a skillful writer, and his narrative zips the reader from beginning to end. Murder of the Century will keep you up at night, borrowing time from tomorrow to read ten more pages. Look no further for a summer read that will entertain and educate in the way that only the best books can. On sale today is Paul Collins' newest book, Murder of the Century: The Gilded Age Crime That Scandalized a City & Sparked The Tabloid Wars. How do you know Paul Collins? FB&C readers may recall that he wrote for the magazine once or twice, that he is NPR's "literary detective," and that he is the author of such bookish titles as Sixpence House, a memoir of life in Hay-on-Wye, and The Book of William, a sleuthing history of the first folio. This new book is an account of a grisly New York murder at the tail end of the nineteenth century. A human torso is found floating in the East River, severed limbs in Harlem, and a mysterious bloody pool in Long Island -- and who's piecing it all together but the newspapermen employed by Joseph Pulitzer (for the World) and William Randolph Hearst (for the Journal). The vile details of this murder mystery created the perfect storm for tabloid journalists, who, in many cases, worked harder and better at locating evidence and suspects than the police. Of course, they also plotted against each other, fighting for higher circulation. Though a different case, Collins' true crime tale is reminiscent of Patricia Cline Cohen's The Murder of Helen Jewett. His publisher also makes an apt comparison to Larson's Devil in the White City. Which is to say that this is a book that has been thoroughly researched and has solid history within, and yet it is far from a dry, scholarly tome. The rich cast of characters -- a married midwife murderess among them -- is better than one finds in fiction. Collins is a skillful writer, and his narrative zips the reader from beginning to end.